Experience the best of the best life and attractions the cosmopolitan city of Johannesburg has to offer. 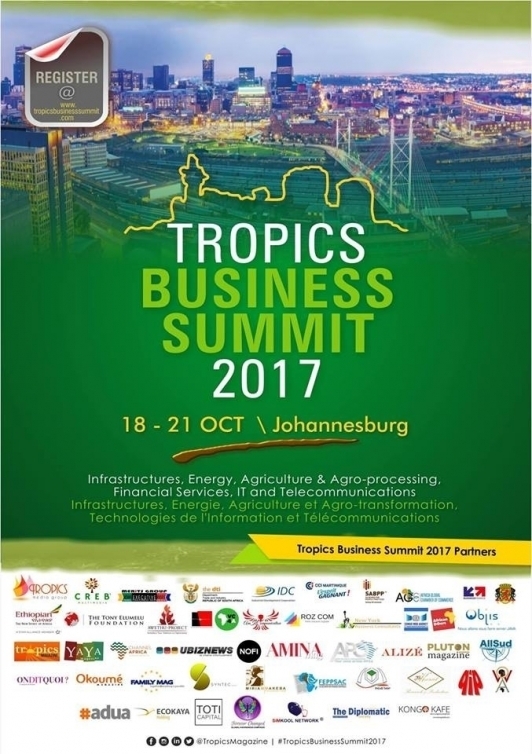 The 1st annual “ TROPICS BUSINESS SUMMIT : Summit on African Trade & Investment Opportunities ” , set to take place from the 18th to the 21st October 2017 in Johannesburg (South Africa), aims to bring more than 150 global business leaders, young innovators, political figures and economic decision-makers to « Find Synergies & Build Africa’s Economic Gateways » . Our keynote speeches, panels and conferences have the participation of eloquent Ambassadors, Members of Governments, CEOS and Speakers such as : HE Ms. Susana Caputi (Honorary Consul of the Plurinational State of Bolivia in South Africa), Tintswalo (Executive General Secretary at SACONO - South Africa), Lathasha Subban (Head of Knowledge & Innovation, SABPP - South Africa), Yolanda Mabuto (Finance & Marketing, Ultimate Delight Distributors - Cape Town), Vincenzo Romano (Marketing Expert at Vincenzo- Romano.com & Business Development for Ploomia.com Marketing Agency-Italy), Vanessa Carter (e-Health Expert and Founder, #hcsmSA), David Salomon (CEO, Forward Integration Chemicals - South Africa), Christelle Pandanzyla (Founder, Empow'Her Network - Belgium), Yusuf Randera-Rees (co-Founder & CEO, Awethu Project - South Africa), Kriss Brochec (CEO, Congo Web Agency & Founder, AMID Congo), Tania Tome (CEO, ECOKAYA-Mozambique), Thandi Moyo (Head of Government Printing Works - Home Affairs - South Africa), Alize Utteryn (CEO, ALIZELAVIE MEDIA - New York), Malko Ebers (CEO, New York Business COnsultants - USA), Elizabeth Patricia TRAORE- ANDONY (Chairwoman/CEO, CMO - London), Mariam Inna Kanoute (CEO & Founder, Potentiel - Mali), Mansour Diop (General Manager, BURHAN Company for Trading and Investment / CEO, PFM IMMO - Senegal), Olga Balangala (CEO, 24Karat Research & Productions - South Africa), Nolonwabo Sinazo Sandisiwe Qunta (co- Founder of WeTalk & CEO of Konnect House - South Africa) and many more. The event will be four (4) days marked with an incredible panel of speakers who will empower and share their stories and experiences on their journey to success. Round up all your business partners and entrepreneurs and book your tickets today! 2/ The MAKEBA CENTRE FOR GIRLS , founded by Dr. Miriam Makeba / Miriam Makeba Foundation.